Still struggling to manage your inventory? Always full of items that you don't know how to deal with? This add-on will help sort things out! 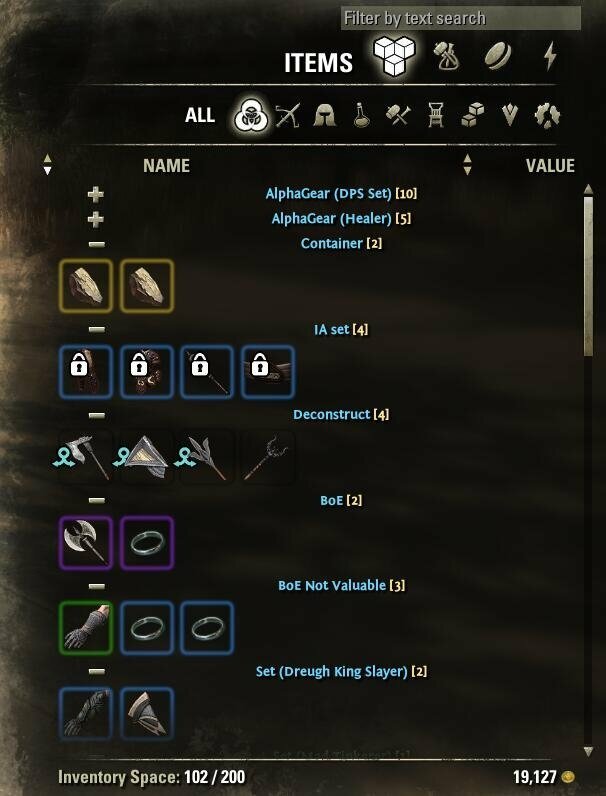 Auto Category adds categories to your inventory, bank, guild bank, craft bag, and crafting station screens. Fully customizable! Pre-defined rules and settings for beginners, download and use with no more settings required. Just that easy! A nice header is added for each custom category. Get a clear view of your inventory. Gamepad with BetterUI is supported. Fully customizable rules based on LUA, for advanced users you can categorize items as the way you want. 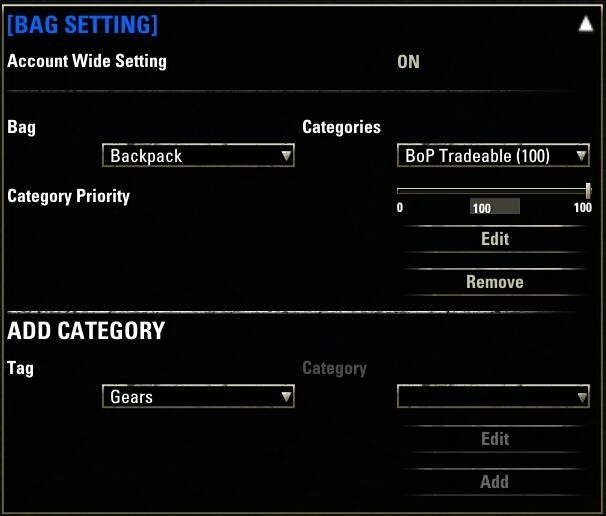 Use pre-defined or your own rules, applying them to your backpack/bank/guild bank/craft bag/craft station, it will refresh categories immediately without reloading. Complete wiki for learning rules. Need more rules/Have great ideas/Need other add-on integration? Just request a new API! Auto group for your set items without adding rules one by one. Any donations will keep me make more good add-on for improving your gaming experience! OK thanks for the response. I guess I don't know how all these settings work exactly but from what you said here it's a bit more clear I guess. I'm not sure what some of this stuff means, though. I don't know what "selling" is..are those ornate items? What is FCOIS or Lakoni's gear changer? I think this would be easier if I could see my inventory in real time while tinkering with these settings. 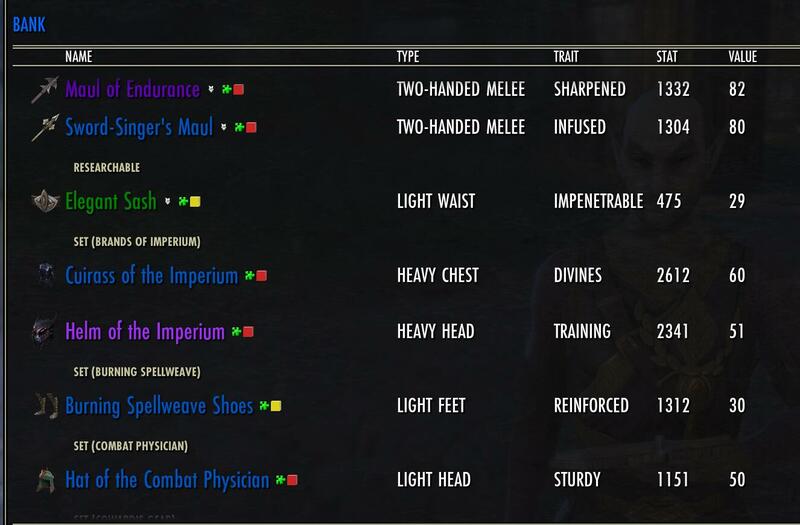 Selling is probably ornate items, perhaps also trash and collectable monster trophies (which you can't do anything with but sell), but I'm not sure because I modified my selling category to include a few extra things from the default definition. Any idea why all my sets are not showing up anymore in the bank? I changed the "sets" category in the bank section to 90 but now I don't see any set items at all. *edit* nm. I guess the hide category option got selected on accident. Last edited by EQBallzz : 03/19/19 at 09:52 PM. Last edited by Shadowfen : 03/19/19 at 09:37 PM. I'm mostly wanting to use this addon for the purpose of grouping set pieces together since the game organizes sets by the name but pieces of the same set frequently have different names. The addon doesn't appear to do this by default so I'm wondering if this is possible? Has anyone done this and if so can anyone give me something I can use to duplicate this? (I assume they have but not sure). This addon (and Auto Category - Wrathstone, which is the newer version) can organize sets - if you set the configuration correctly for that. 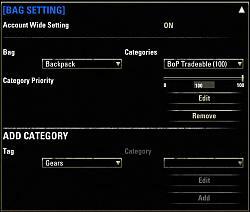 You need to look at the category priorities for the Backpack and move the Set category up in priority until it displays as you want. For instance I have New, BOP-Tradable, Selling, Deconstruction, and Monster ahead of Sets. so that all of the Monster helms and shoulders are grouped together and then other sets are grouped individually by set. The thing that you need to remember is that items in your inventory can qualify for multiple categories, but they are always put in the first category from the list that they fit in. So changing category priorities can change where items get sorted into. OK thanks for the response. I guess I don't know how all these settings work exactly but from what you said here it's a bit more clear I guess. I'm not sure what some of this stuff means, though. I don't know what "selling" is..are those ornate items? What is FCOIS or Lakoni's gear changer? Also, how do some of these things overlap? 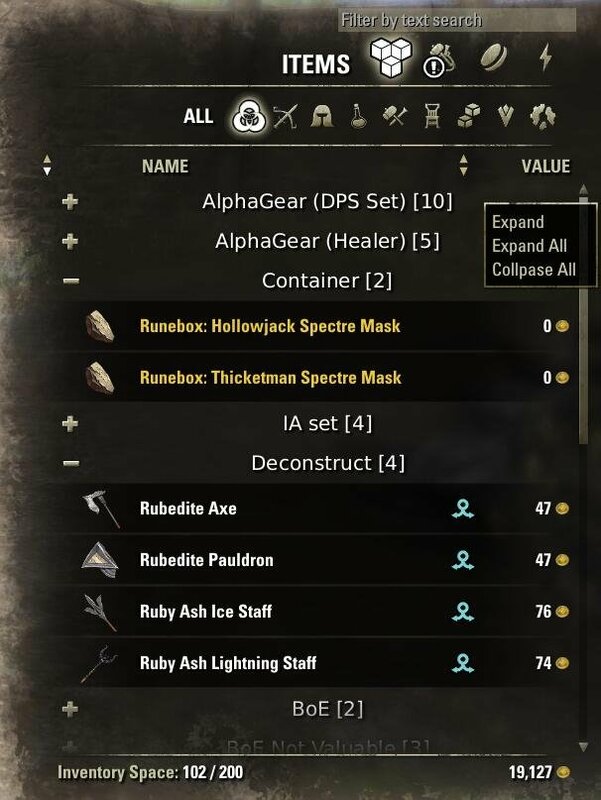 Is the "sets" category only armor or any set piece? Does it automatically place items of the same set together even when they are not named the same? 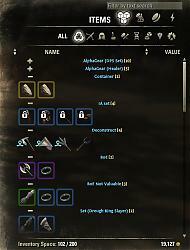 I think this would be easier if I could see my inventory in real time while tinkering with these settings. *edit* I just tried changing the "sets" category to 90 in the bank section and now I can't see any of my set pieces in the bank. I have clearly broken my bank. Last edited by EQBallzz : 03/19/19 at 09:38 PM. I've put up a Wrathstone-capable version of Auto Category. Although it is listed in Patches and Plugins it is the full addon. I can't get the itemname function to work, I've tried it on many items. For testing purposes something simple like "Lockpick" does nothing, lockpicks still just show under "Other" only. 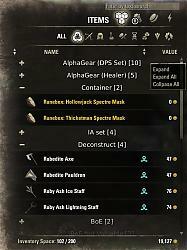 Does this only work on equipable gear? Works for me. Added a Category "Lockpicks" with the rule "itemname("Lockpick")" and then added that category to the backpack with a priority of 100. Shows up just fine. thanks it works. The interface is confusing to me, I was missing the last step to add the category to the backpack. I just started using this addon since I recently had to let ESO+ expire. It has been helpful in organizing the various materials and making it easier to spot the items I want to transfer between the bank, storage containers and alternate characters. I have been experimenting with adding new rules and have been rather successful with such things as separating booster materials, raw materials and refined materials while keeping them limited to their specific craft. However, there doesn't seem to be a way to do the same with jewelry crafting. At least there isn't any mention of such means on the API page. I'm looking specifically for jewelry_material, jewelry_raw_material, jewelry_booster for use with either or both of type or sptype. at line number 67 of the file AutoCategory_RuleFunc.lua (in between "ingredient_vegetable" and "lockpick"). Once you reloadui (or start the game, whichever), you should be able to use these with sptype. First, I really like this mod, but the category "research possible" is stupid because it's proritary, so I wanted to delete it, so I gone into options and I removed "keepresearch()", but now the addon is not working and I can't go back into options. I tryed to delete the folder, install it again, I tried to remove "saved variables" with minion, but nothing is working, I can't get the addon working again. Uninstall the addon. Remove the saved variables. Goto Documents\Elder Scrolls Online\live\SavedVariables and make sure that the file AutoCategory.lua is NOT there. Remove it if you find one. Then you can reinstall the addon using Minion. 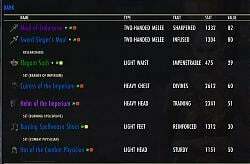 Will this be getting a Wrathstone update? Could this be correct? If it is, where would I insert the code? Or should I be looking elsewhere for the problem that has arisen? Any thoughts, feedback would be appreciated. Thank you. Can't figure out what I'm doing wrong. Some of my characters have their armor sets in inventory grouped together under set categories (what I'm looking to accomplish) and others do not. I even step by step made sure the settings in the addon page were the same (they are) and they some still don't separate by set name. Any advice? Make sure that you do not have any other rules with a higher numerical value that the armor in question could also fall within. Items can only be in one category and they will always sort into the first category going from 100 down to 0. Also, is there not an option to set up the categories globally for all characters? I know I didn't have to set them up for each one individually. Try enabling the global option while running a character that has the categories the way you want them.